My trip to New York was my big celebration. My birthday was Monday October 8. I was in New York the weekend before and then the weekend after (this past weekend) I was in Palm Springs for work. On my actual birthday H and I went to the zoo. We had a great time. I let go of some of my control and let H walk and go at his own (slow toddler) pace. Normally I would be checking my watch and making sure we saw every animal, did everything (rushing through, not wanting to slow down). The crazy thing is that we ended up seeing all of the animals we wanted to see AND had time for lunch before heading home for nap time. My boss got me flowers, a sweet card, and a Tory Burch bag and bracelet (bag and bracelet are the same color as my new Uniqlo cords!). I work for two normal, working parents. They aren't high profile or Beverly Hills Nannies rich. But they are really really thankful for me and they go all out for my birthday. It feels good to be recognized for my hard work! I went to dinner with my parents. We had cupcakes and presents at my dad's after. My stepmom and dad got me these "K" and "H" Jonathan Adler pillows. My sisters got me new polka dot cutlery and a magazine holder. I really needed both! My friend M got me this owl night light. This is a phone photo but it's really cute-perfect for fall and Halloween (I am going to do a separate post on fall decor in my apartment)! ETA: Apparently I was half asleep when I composed this last night! I forgot to include the Jonathan Adler elephant mug from Natalie! Natalie is a new mom that appears to have things more together than I do! 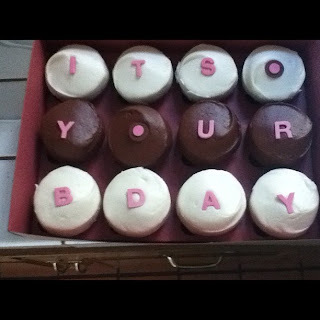 It sounds as though you were properly feted for your birthday. Best wishes!! You are a special person and loved!! Happy (belated) birthday! 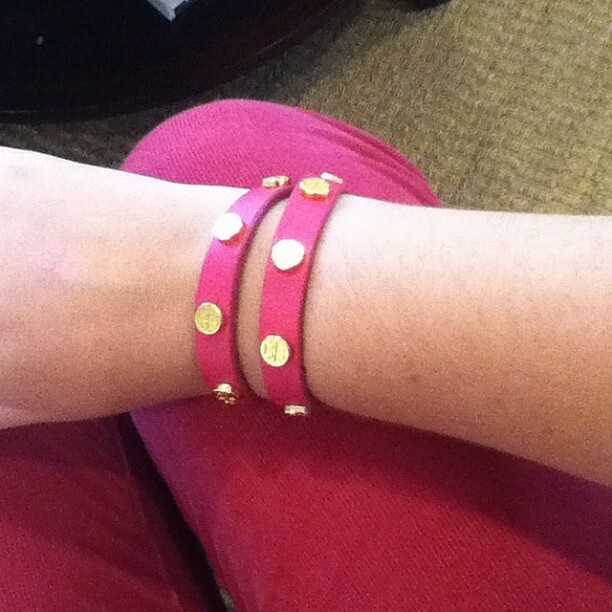 That bracelet is too cute -- I've been lusting over them for a while now! Wow! So glad you had a great birthday. I'm glad I was the last one to celebrate with you before you turned the big 2-5! Your employer seems so sweet and generous - and she knows your style well! My sister bought me two pairs of Uniqlo leggings when she visited me this weekend! Can't wait to see you in December. I would love to spend my bday at the zoo! I love those pillows. Wow-have a lot of people who love and spoil you. Happy belated birthday. Happy Birthday my dear! Glad we're nautical friends, but I am kind of jealous that you went to the zoo AND got a TB bag. Sigh. All look like great gifts. enjoy. Happy Birthday!! Love your gifts!! Happy belated birthday!! And the New York trip sounds amazing as well as all your gifts!! Happy Belated Birthday! Looks like you were properly spoiled! Let me know if you wan't to give me those pillows.....K and H and pink and my birthday is October 22....just saying. Happy Birthday! Lots of awesome presents! Um... I want every single one of your gifts! Everything is so cute. I hope you had the happiest birthday! Looks like you had a great birthday! Those cupcakes look delicious!